Are Arkansas’s Burdensome Licensing Laws Increasing Crime? In an op-ed entitled “Let them work” in the Arkansas Democrat-Gazette on March 4th, UCA Associate Professors of Economics David Mitchell and Thomas Snyder say some licensing laws hinder ex-offenders from being able to get honest work and also burden Arkansas taxpayers with the added costs of incarceration. Mitchell and Snyder also mention ACRE’s new policy brief, “Second Chances: The Importance of Occupational Licensing Reform to Arkansas’s Criminal Justice Reform Initiatives”, coauthored by Snyder and Stephen Slivinski, senior research fellow at the Center for the Study of Economic Liberty at Arizona State University. This brief takes a close look at the relationship between Arkansas occupational licensing laws and crime recidivism. The recidivism rate measures how many former inmates end up back in prison after being released. “A recent ACRE study shows that five-year recidivism rates fall by 3.5 percent for every 10 percent reduction in licensing burdens. According to a 2017 Institute for Justice 2017 report, Arkansas licenses about double (72) the amount of low-to-moderate-income occupations of Missouri (37) and Kansas (35). These occupations aren’t physicians–they are low-to-moderate-income occupations. Mitchell and Snyder recommend lowering Arkansas’s recidivism rate by narrowing restrictions on obtaining a license to crimes directly related to performing the occupation as opposed to blanket bans of those convicted of any criminal activity. They also recommend doing away with vague phrases in licensing language that prohibit “moral turpitude” or require “good character” which can be used to unfairly discriminate. This would still allow for those convicted of crimes related to certain occupations to be prohibited. You can find more of ACRE’s research on labor market regulation here. 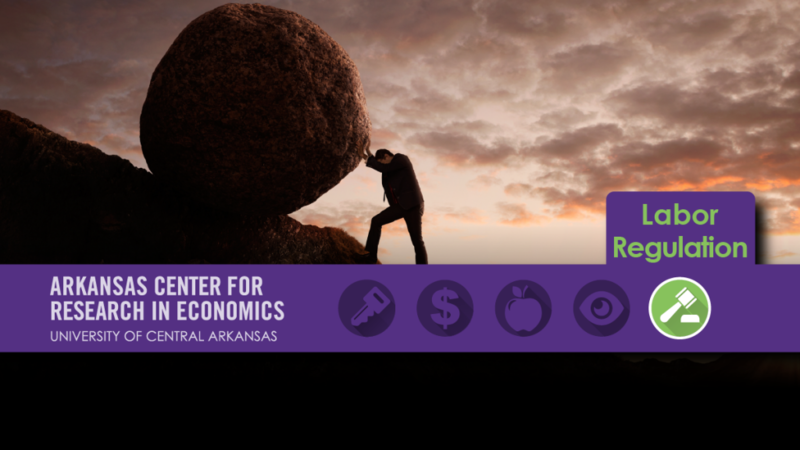 Slivinski also presented his research at UCA last year in a talk entitled, “Weighing Down the Bootstraps” which was a part of ACRE’s Distinguished Speaker Series. For a national look at occupational licensing reform, check out our policy review, “Occupational Licensing Reform Across the United States” by Marc Kilmer.